Just call me Tonya, destroyer of diets. Slayer of sensible eating. You will rue the day you read this post. I’m sorry in advance. I’ve managed to resist the temptation to make this dessert for almost a year. However, 364 days is the most I can say “no” to something I really want. Even I have my limits. Ever since my cousin posted the recipe on her blog it has called to me. 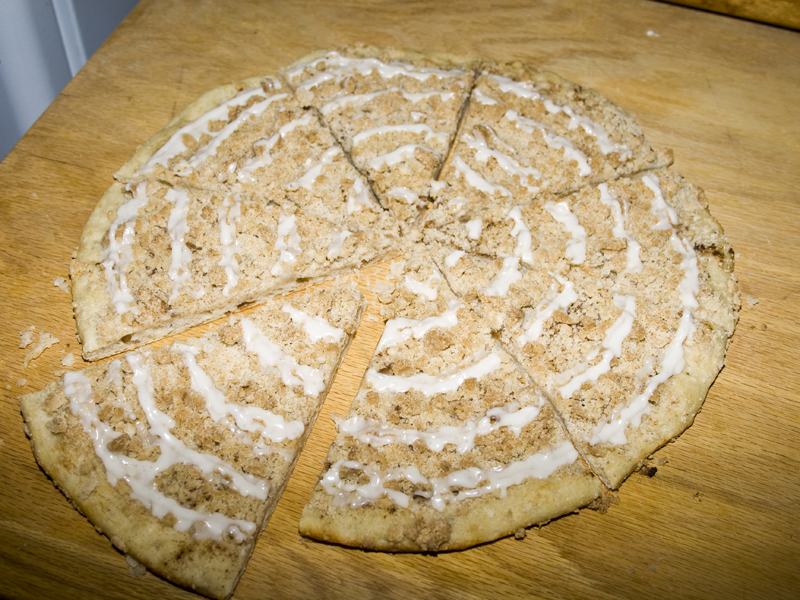 I maintained self-control because I knew from looking at photos, this dessert pizza copycat was the devil. And I was right. Pure evil. Finally, my resolve broke. 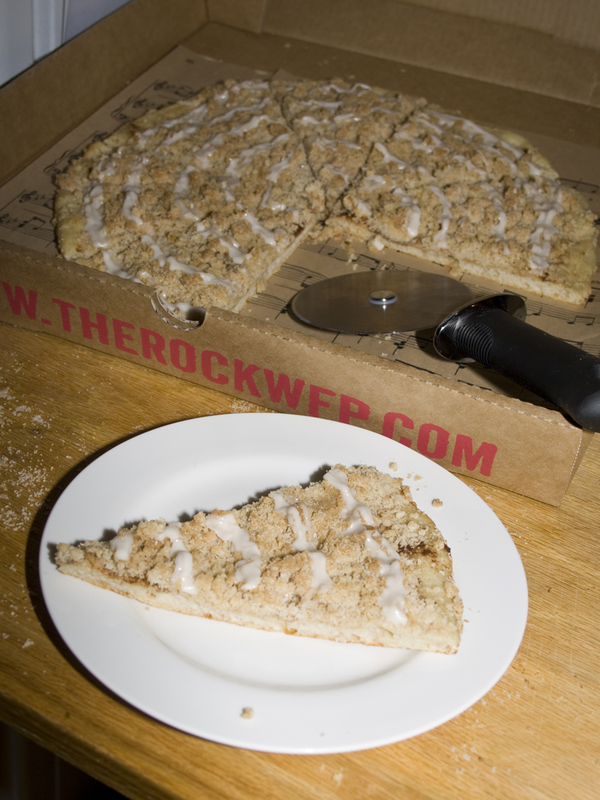 I drove by the former location of a Godfather’s Pizza today and started dreaming of luscious cinnamon streusel deliciousness all the way home. I swung by the grocery store, picked up a ready-to-go pizza dough and about 10 minutes later was burning my hands and my tongue as I shoveled a piping hot, perfectly crisp and sweet piece of glorious into my mouth. Oh heaven. I am not kidding you. I could open a pizza place that served only this and make buckets of money off all the Godfather’s Pizza lovers who no longer have one around. It is that perfect. Attention “The Rock Woodfired Pizza”. Make this and put it on your menu. I’m begging. If you’re wondering why I have a Rock pizza box lying around, it’s because my sister got me some to make battleshots out of. But that’s another story. I’m sorry, I can’t tell it now – I have some more pizza to eat. 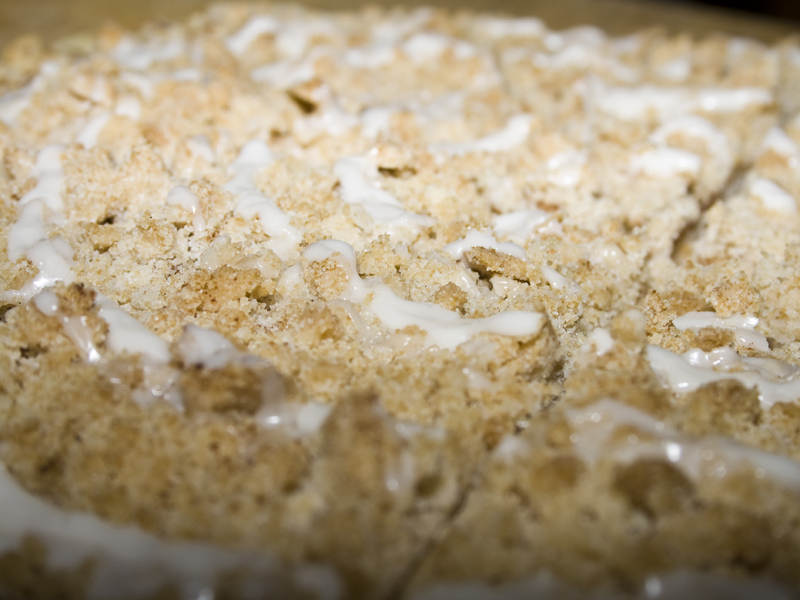 Preheat oven to 460° F. Mix together streusel ingredients with a fork, or your clean hands, then side aside. To make pizza, pat dough into a 12 inch pizza pan that has been sprayed with oil. Perforate pizza dough with a fork (this keeps bubbles from forming), then brush with 1 TBSP melted butter. 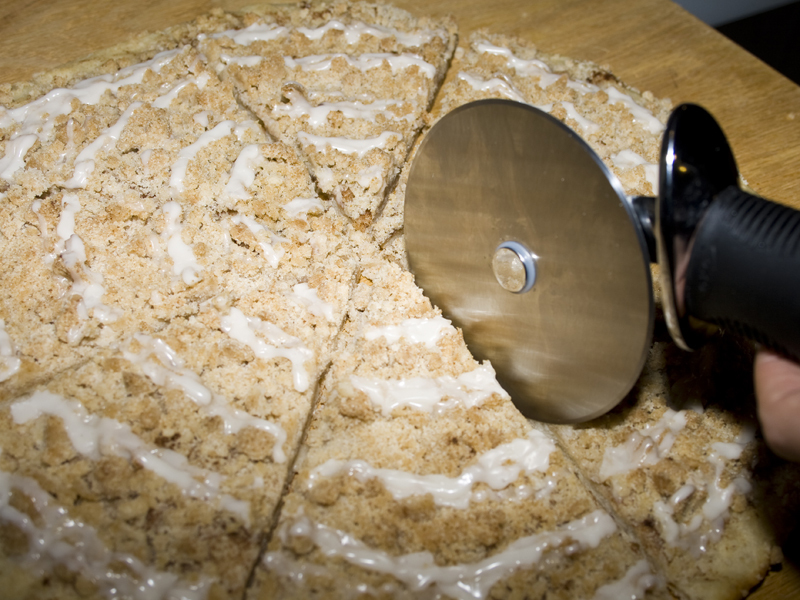 Sprinkle cinnamon all around buttered crust. 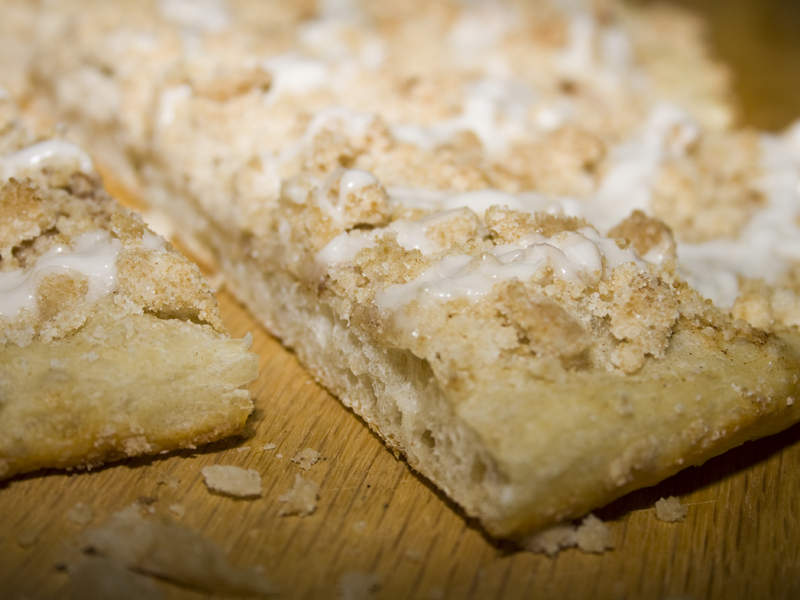 Top pizza crust with streusel mix, crumbling in your hands to make nice pea sized chunks. Bake at 460° F for 8 to 9 minutes depending on the thickness of the pizza. Mix icing ingredients until it is of a drizzle consistency. If it is too thick, then thin with a small amount of milk until you have reached your desired thinness.